I had known about the concert but didn’t know the date until I saw that #TragicallyHip was trending on Twitter during #RecordSaturday. As soon as I was done playing Pages, I found the concert streaming online and watched the rest of it, taking my eyes off the screen only long enough to tweet a few show notes. 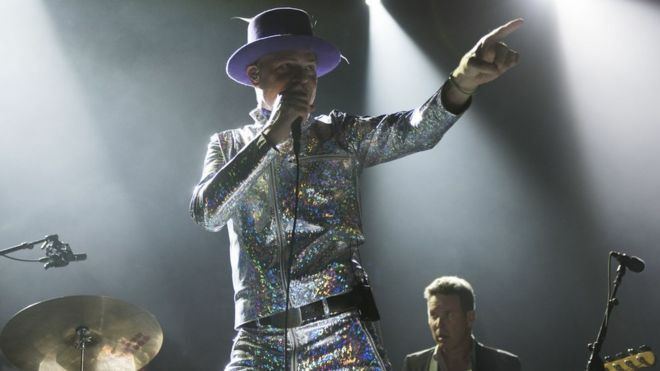 I was bowled over by the energy he brought to the stage, the raw power of his voice and the outpouring of love across Canada, where viewing parties were held in private houses and town squares and bars. I don’t know if we have anything like that in America, a national band that is encrypted in our DNA. Bruce Springsteen, maybe? (and you just know Chris Christie would give up everything he had to have Springsteen speak as lovingly of him as Gord spoke of PM Justin Trudeau, in the audience and crying like a baby). He paraded in his sparkly suits and feathered top hat. You wouldn’t know he was looking at the lyrics on teleprompters set up at every angle unless you saw them. It looked like every other fabulous rock show, full of energy and life. But watching him scream, cry and drop the mic during the encore performance of “Grace, Too” was one of the most profoundly emotional moments I have ever seen in a live show. The camera panned over the audience and you could tell it was hitting them too to see him like that. This is it and he knows it, and we all know it. The weight of the moment, of the end of a 30 year career and, too soon, a life. It would have been a natural note to end on. But he wasn’t going to say goodbye in sadness. He pulled out three more songs, ending with “Ahead By A Century” before he said, “Thank you for that” and left the stage for good. My eyes are still swollen from crying. But I heard music in my dreams.